We often hear that a car has been completely restyled or redesigned, but in the case of the handsome 2016 Kia Sorento, the all-new is all true. 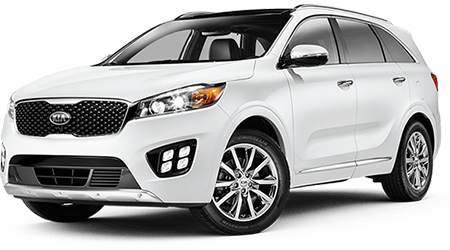 Even if you think you know what the Kia Sorento is all about, come to Cumberland Kia to see what the Sorento looks like now. For starters, it looks like a deluxe, upscale version of its previous model years. By setting the headlights closer together, Kia has set the Sorento apart from any other SUV out there. The narrower front end and lower air intake are just what the 2016 Kia Sorento needs to complement the new turbocharged engine option; and the eye-catching new foglamp bezels are exactly what you need to make your neighbors envious. The 2016 Kia Sorento is noticeably longer with a 109.4 wheelbase, going from an athletically-designed SUV to a full-blown beefy hunk. One test drive, and repeated looks, will convince you that the Kia Sorento is all grown up and ready to rumble. Drop by our luxurious showroom at 1560 Interstate Dr in Cookeville, TN, for a taste of new Sorento. We are freeway-close to Lebanon, Crossville, Mcminville, Franklin, and Chattanooga so plan on visiting us soon, to see what "all-new" is supposed to look like. It's no secret that the Kia Sorento sells like hotcakes to the off-road segment, but not for the reason you think. Even if you don't plan on trekking through the Amazon jungle or driving up the face of a mountain, the new Kia Sorento will serve you well. If you ever drive to the beach, commute in the rain, or have the need to tow a heavy load, the available Dynamax All-Wheel-Drive (AWD) system will really come in handy. It gives you confidence on the road and peace of mind in hazardous conditions. You get to customize your 2016 Sorento with the engine of your choice: the most fuel efficient is the 2.4L four-cylinder; the most powerful is the fearless 3.3L V6 all-wheel-drive dynamo that lets you tow 5,000 pounds without breaking a sweat; the most exhilarating is the speedy 2.0L turbocharged model. The new Sorento offers the latest safety features known to man, making it one of the safest SUVs on the road. You get dual front airbags, front-seat-mounted side airbags, and side-curtain airbags for both front- and second-row seating positions. Plus, the Sorento has a new airbag sensor system that deploys airbags according the severity of the crash, the presence of a front passenger, and seat belt use. Most other SUVs on the market don't have anything like it - yet. In the past few years, Kia has made quantum leaps forward in safety research and development, and it has certainly paid off handsomely. The 2016 Kia Sorento was recently awarded an NHTSA Overall 5-Star Safety Rating, its highest accolade. The year before, it was named a Top Safety Pick by the Insurance Institute of Highway Safety (IIHS). That infusion of 55% advanced high-strength steel is not going unnoticed by the industry. When it comes to braking, the Sorento pulls out all the stops with Electronic Brake-force Distribution (EBD), a Brake Assist System (BAS) for emergency situations, and Hill-Start Assist Control (HAC) to keep the Sorento from rolling backwards. See the All- Sorento at Cumberland Kia, where we always go the extra mile for our customers and their vehicles. Located at 1560 Interstate Dr in Cookeville, and also serving Lebanon, Crossville, Mcminville, Franklin, and Chattanooga, we have a large selection of the 2016 Kia Sorento in all its trim levels and accessory packages. Come test-drive the 2016 Sorento without delay, because when we say "all-new," we really mean it!